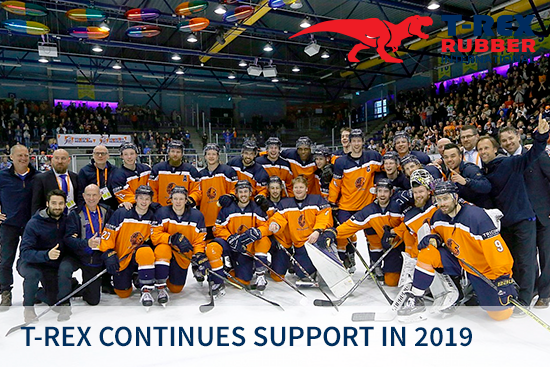 T-Rex Rubber International has been the Official Sponsor of the Dutch National Ice Hockey Team since 2016 and we will continue to support our “Dutch Lions” in 2019! After winning every game of the World Championship in Division II A Team Netherlands was promoted to Division I B. This year Team Netherlands will face Poland, Estonia, Ukraine, Japan and Romania, Ukraine in the Tondiraba Ice Hall in Tallinn, Estonia. Please find updates about Team Netherlands on www.trexrubber.com/icehockey. Official schedule and other information about this tournament on www.iihf.com.